The Zeonic Geofront: I really love Tron's viral marketing campaign. 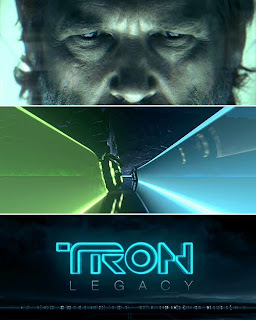 Beginning with the Flynn Lives website that went live early last year Disney's marketing team has been slowly weaving a back-story to explain the macguffin of the new Tron movie; where has Flynn been for the last 27 years? The length and breath of this effort is amazing. It's similar to the viral marketing Bad Robot did for Lost over it's first three seasons. Bringing the show to the internet, and pull the audience deeper into the mystery by giving them clues and games to play on the internet. It goes a little deeper than Lost though in that it goes beyond electronic communication. What their doing is called an "Alternate Reality Game" or ARG. It seems I've been asleep over the last couple of years because according to Wiki a few recent video games had similar stunts as part of their marketing, but these all seem to be fairly small scale. More like marketing stunts as oppose to something that is immersive. Flynn Lives is more along the lines of Majestic. Majestic was one of the very first mainstream ARG. I never played it but I remember when it came out being intreigued by what it was all about. At the same time it seemed a little creepy. It was very much like "The Game." You started out playing the "game" Majestic, but then the game stopped, and the the phone calls, faxes, instant messages (thank god this was before text messaging) started. You were immersed into the world, at least that was the intent. Despite winning best new game at E3 in 2001, 9/11 threw a monkey wrench into things as people didn't really want to play a game about conspiracy and terrorism when it was happening in real life. EA quit supporting the game in mid 2002. Flynn Lives seems to be along the same lines. I haven't really started playing it, but I recently signed up; and I'll keep apprised as to what I find out. They do ask for your email, phone number, and address so they can send you clues and info by the various methods. We'll see how it goes. In the meantime here's a little palate cleanser to get you started. This is a puzzle game created as part of the effort. You must work your way though all 56 visual puns in the picture and name the video game they're suppose to represent. Once you done you get the opportunity to design, and have mailed to you, your very own ENCOM security badge. As part of the larger game you need the badge to break into ENCOM, and get more clues about Flynn. It took me about 30 minutes to get them all, I will admit to cheating on a couple of them. It's been out for almost a day already so the answers are out there if you look hard enough.